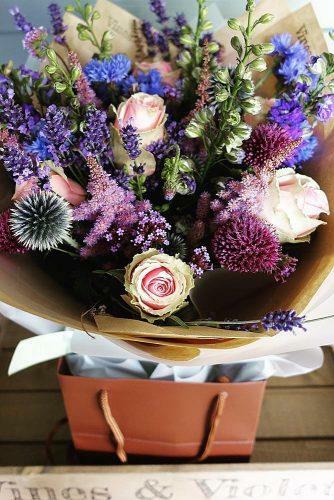 Engagement gifts might not be necessary, still, everyone appreciates them! 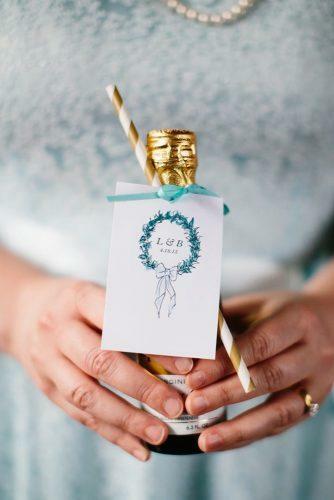 It is a perfect opportunity if you have a close relationship with the bride, but won’t be able to attend the ceremony or simply want to give a little something extra. Follow along to find some great ideas to fit every budget. Gorgeous gift baskets, customized spirits, and personalized champagne flutes… And maybe a bit of something sweet? There are a lot of creative ideas, and we have selected all of the best ones in this article. Just look through and make your choice! 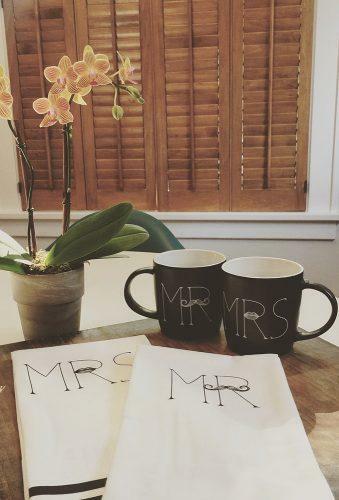 First, we asked our specialists to weigh in on whether or not you need to celebrate the future Mister and Mrs. with a gift right off the bat. 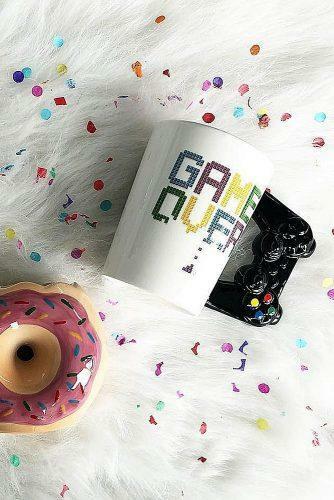 Do you need engagement gifts? 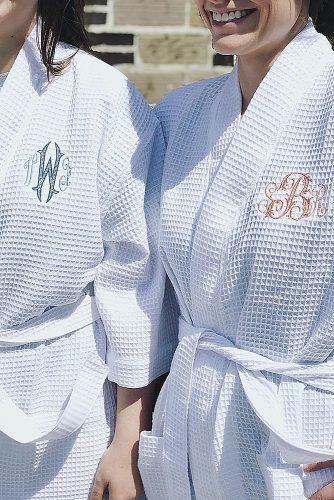 A Trendy Gift For Every Bride! Do you give money for an engagement party? Engagement gifts are not entirely necessary. 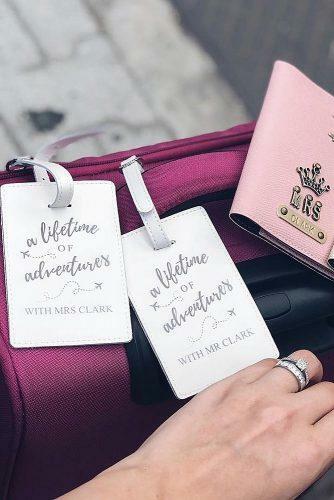 You’re already spending money on wedding gifts, travel, accommodations, and wedding outfits. 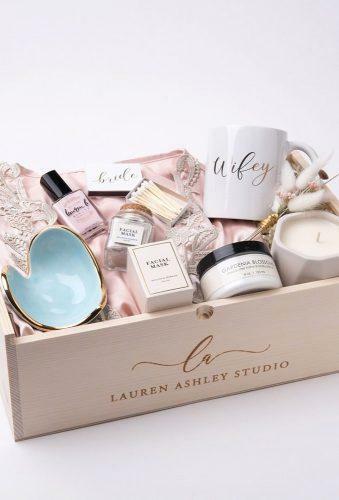 But, if you’re the type of person who wants to show their love as the couple celebrates their pending nuptials, this list will help you find the perfect engagement gifts. 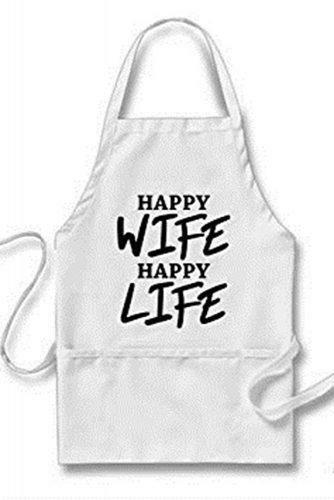 Buying a great gift for the bride and groom is usually harder than you expect. 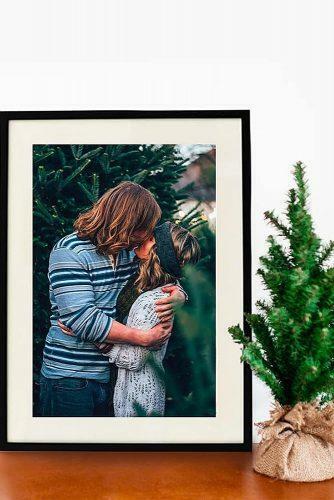 Sometimes you’re working with a tight budget, sometimes you’re not super close to the couple, and sometimes you’re gifting a good amount of cash but still want to add a little something special. The following ideas will touch on your budget, your relationship with the couple, and your desire to get them something unique. 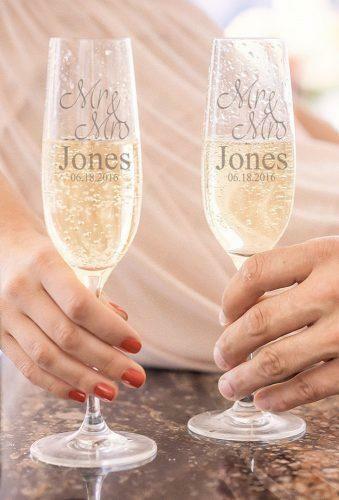 Etched glass is always classy and makes cute engagement gifts. 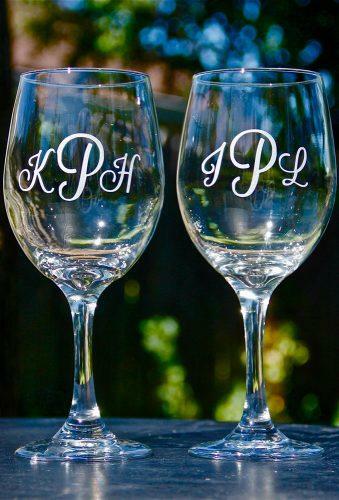 Coming in at a comfortable range of prices depending on the quality you’re after, you can choose from wine glasses, champagne flutes, beer steins, whiskey tumblers, or a mix and match for Him and Her. 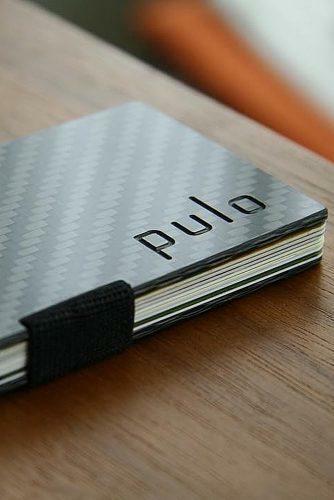 A personalized gift is, well, personal. 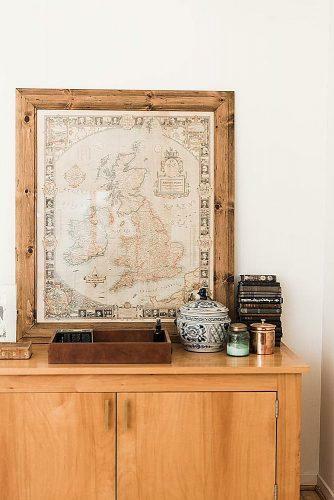 A set of mugs or a pillowcase may not seem like a big deal, but these are gifts that they can appreciate on a daily basis as opposed to one big “wow”. It’s like the wedding gift that keeps on giving. This recommendation is perfect as engagement gifts from parents. Weddings are about bringing friends closer and making families bigger. 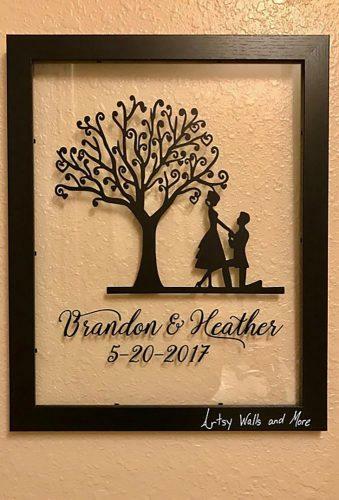 Certain items like the guestbook, wedding ring dish, or precious family heirloom will represent this for a lifetime and make for a tear-jerking wedding gift. Laughter is the best medicine. 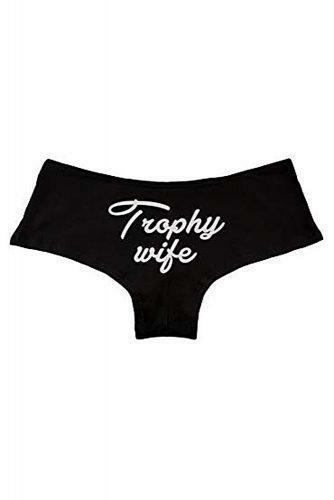 Leave the newlyweds feeling happier and healthier with funny engagement gifts like this “Trophy Wife” thong or “Game Over” coffee mug. Want to give something original and useful? 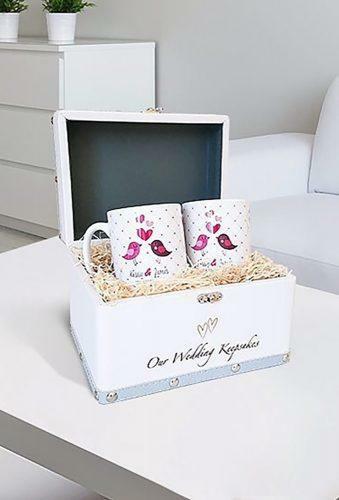 Some fun wedding themed surprise gift any bride would appreciate? 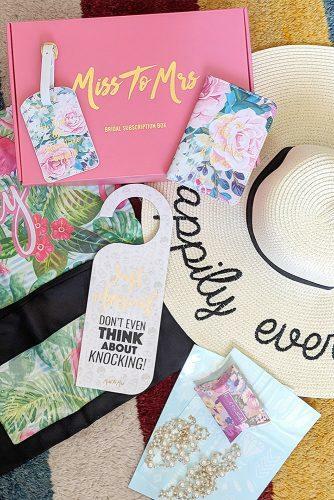 Try Miss To Mrs Bridal Subscription Box! 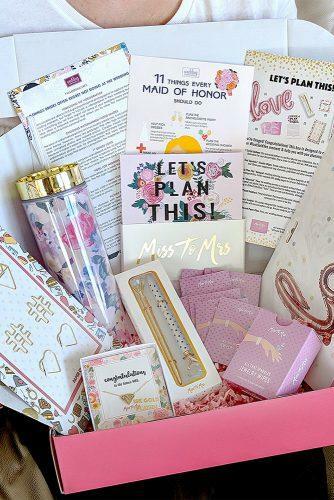 These boxes come every month and contain fun wedding themed goods. 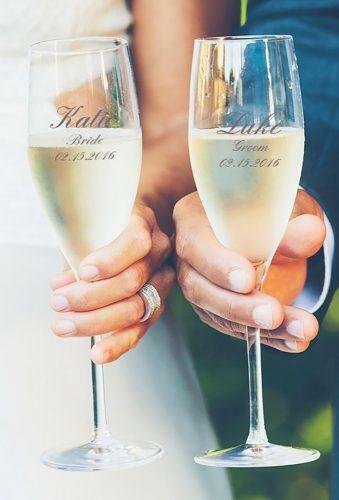 This is a newest trend to help relieve the wedding stress and help with all the wedding planning! 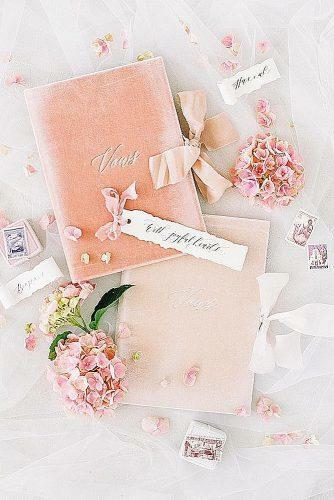 We all know that wedding preparations can be very time consuming and challenging. 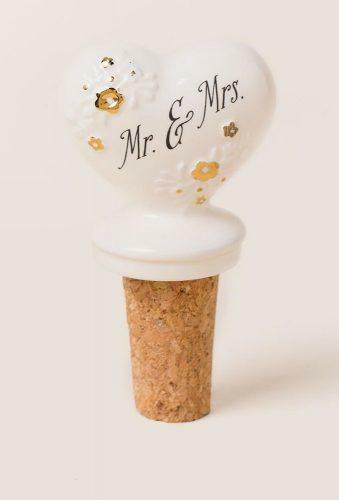 Bring in an element of fun, with useful wedding-themed goods. 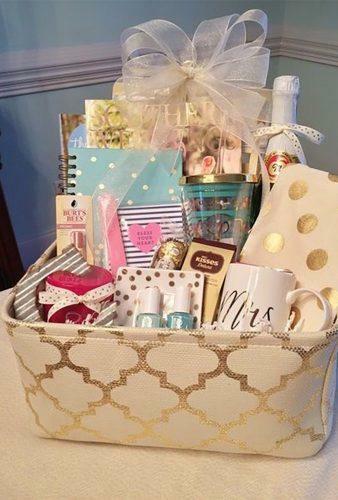 Each month the bride will receive something to help her plan the wedding. 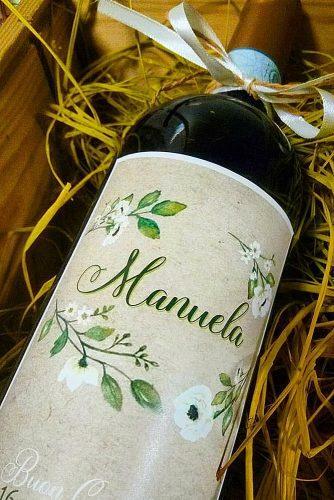 It is a perfect gift for any bride! What is inside? You never know! 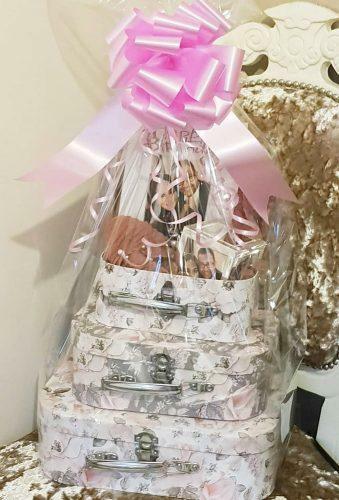 Last year brides received in the boxes such awesome gifts as a floral kimono for the morning after, ‘Just married’ car sign, diamond wipes and etc! 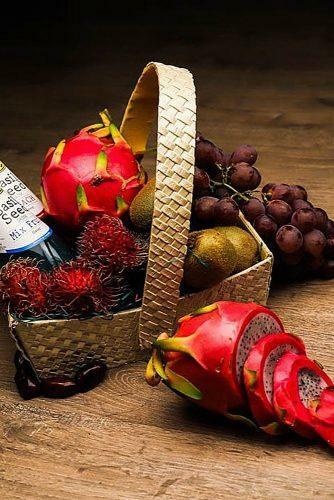 Gift baskets will never go out of style and they’re always well-received. Choose from a pre-selected assortment of items or hand-select the perfect combinations that you know the couple will love. 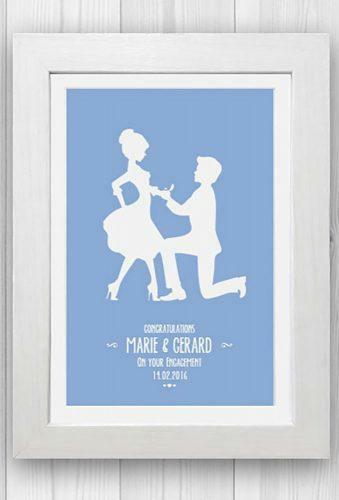 Use these as engagement gifts (it’s a great idea for a wedding gift as well!). 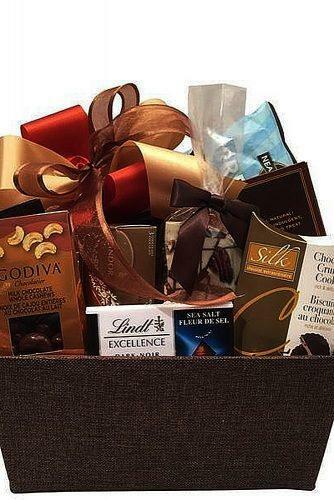 Again prices range so his & her gift baskets are a great option for any budget. 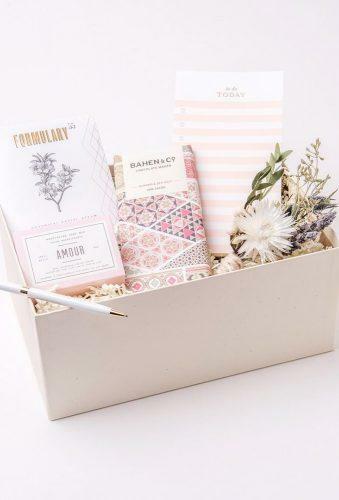 You can expect a mix of modern and traditional engagement gifts in these baskets. The happy couple has created their first happy memory as a family and they’re going to be creating plenty more. 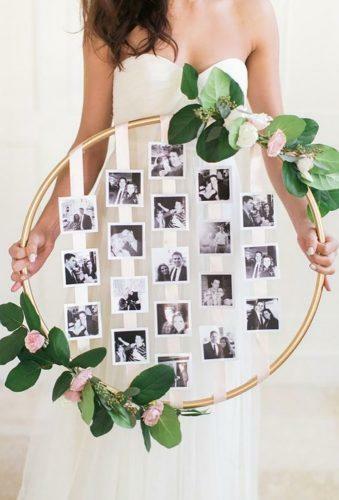 Help them capture these memories with elegant picture frames. 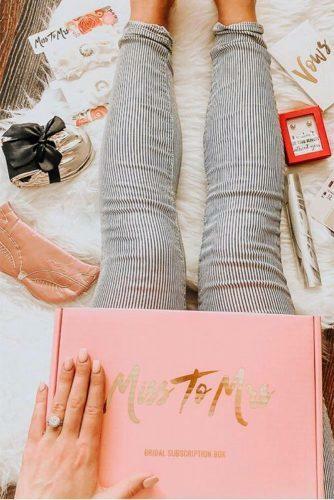 Your engagement gifts for best friends should show how well you know them. Choose a specific frame for that wall or desk you have in mind. It’s a happy moment when someone you know announces that they’re engaged. It’s even sweeter when it’s a family member. 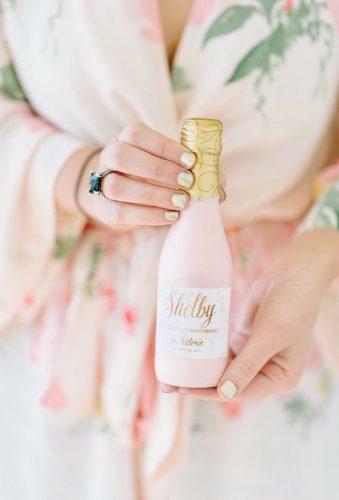 Let your sister know how sweet she is with these delectable engagement gifts. A note with ‘May your life together be just as sweet’ will add a personal touch. Even if you’re already getting her something grand, this little extra engagement gift for a sister will be much appreciated! 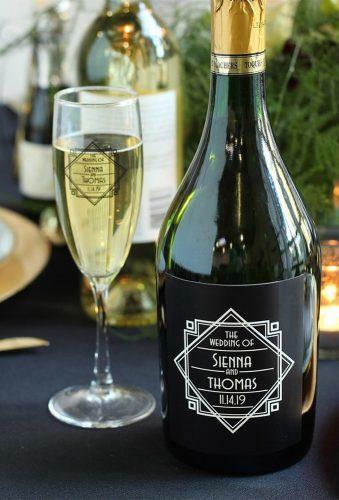 A nice bottle of wine, champagne, or scotch are great engagement presents for almost every couple. Take it to the next level with a custom label. 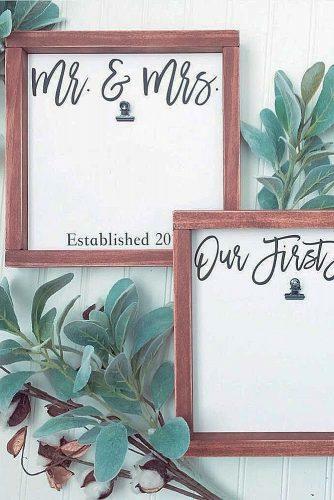 Choose a fancy font and make sure to include their names, wedding date, and your personal message. 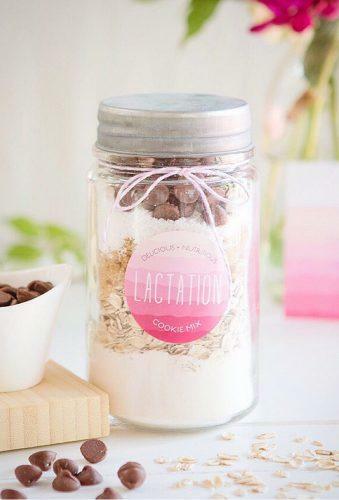 Whether you’re on a budget or super creative, a DIY is the best engagement gift you can give. 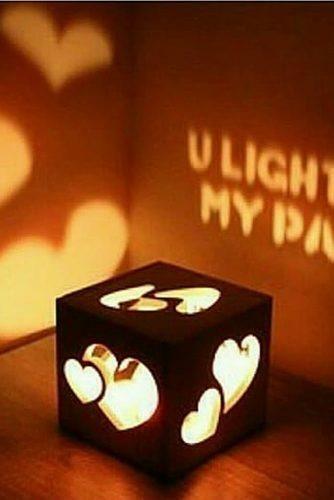 Try your hand at a simple etched candle, custom picture frame, or unique item of your own creation. 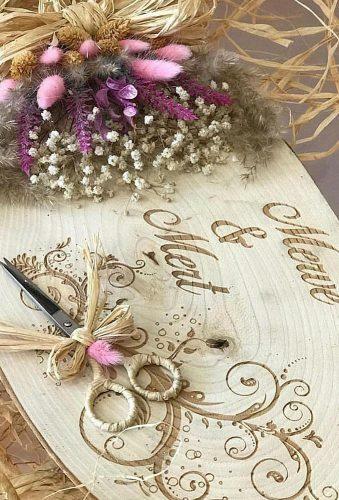 Follow the wedding theme whenever possible, like with this hand-carved wooden sign for a rustic wedding. 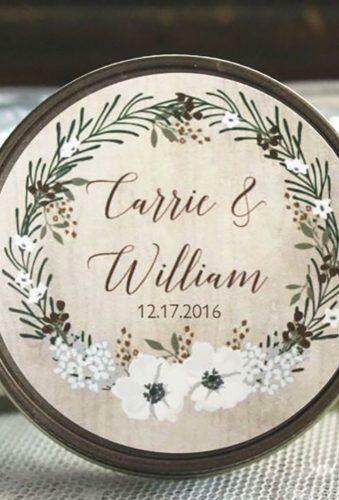 A nice gift for the newlywed’s home is always a great idea, but a gift that celebrates the couple’s Big Day is even better. 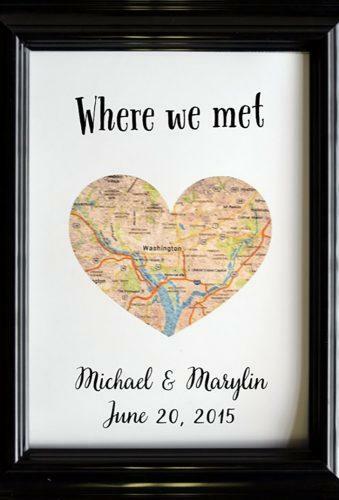 There are plenty of thoughtful gifts for couples that you can etch or print the wedding date like our favorite “This is where we met” frame. Be unique and be personal. 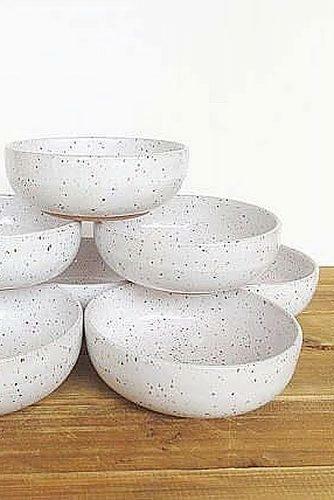 If you dread buying gifts for couples who have everything, you’re in luck! Newlyweds have just opened the door to a whole new world of things they don’t have yet. 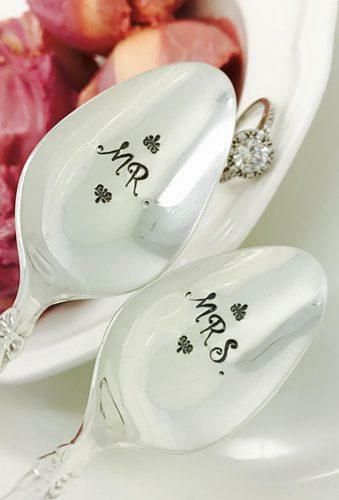 Be first in line with a cute set of Mr & Mrs engagement party gifts like these adorable silver spoons or bath towels. 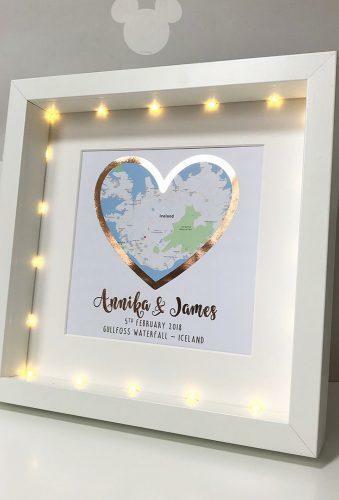 If you don’t want to break the bank, but still want to present to the happy couple a memorable and thoughtful, but cheap engagement gift, look no further. 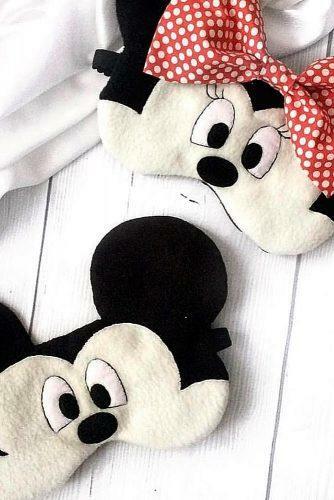 Here are just several examples of adorable trinkets you could get. 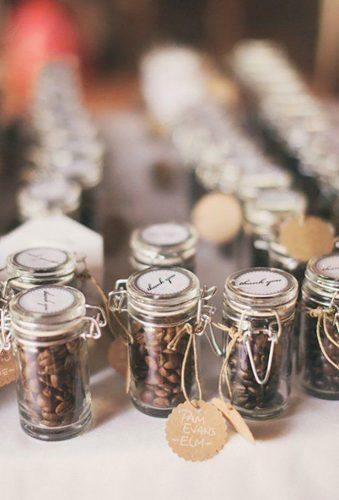 Something decorative like Craft Coffee Beans will brighten up any space. 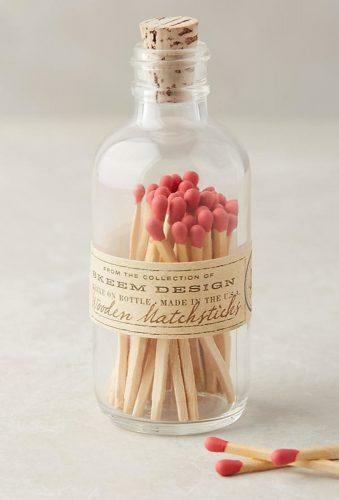 Something functional like a jar of matches with a custom label will look pretty AND come in handy when it’s time to cuddle up next to the fire. 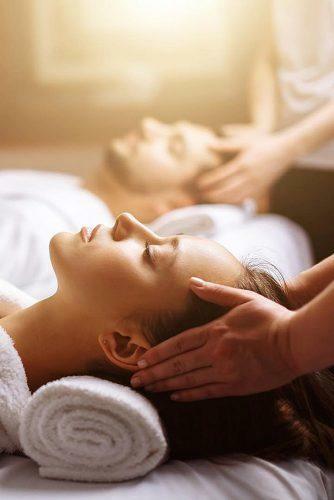 The couple that relaxes together smiles together, so give them the unique engagement gifts of a spa day and downtime! No matter how ‘manly’ the groom is, there’s no man on the planet that can resist a deep tissue massage. 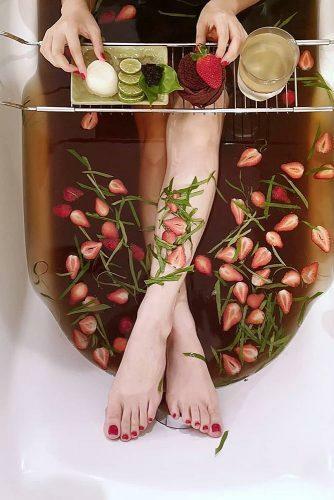 This is extra special is especially nice as a gift from the parents – you know better than anyone else how valuable relaxing is. 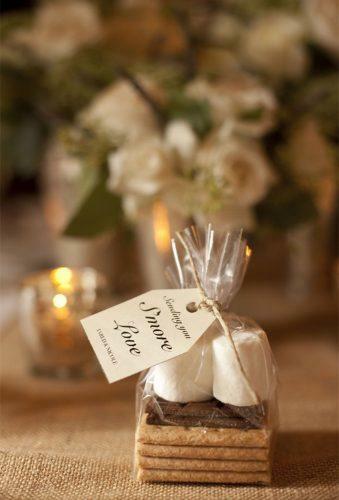 For newlyweds with a sweet tooth there’s no better gift than a custom dessert. 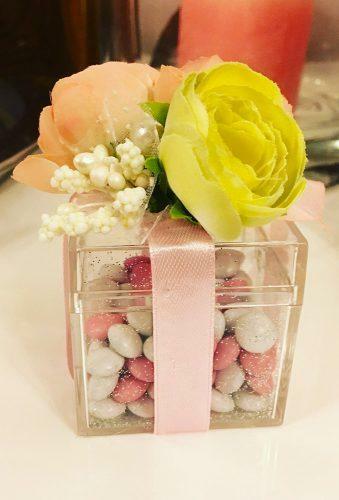 Assemble a selection of chocolate covered blueberries and truffles, or craft a unique ice cream flavor as your unique engagement gift for daughter. 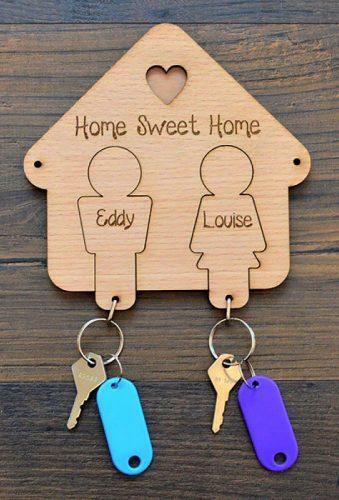 For couples starting a brand new life together, there’s no better gift than a head starts on turning their house into a home. 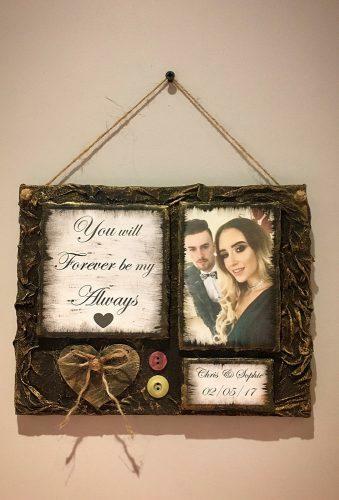 Home decor like a personalized canvas print or LED light shadow box will look great on their walls and tabletops and will be a constant reminder of the love they shared on their wedding day. The newlyweds are about to set off on their honeymoon and have a lifetime of family vacations to look forward to. 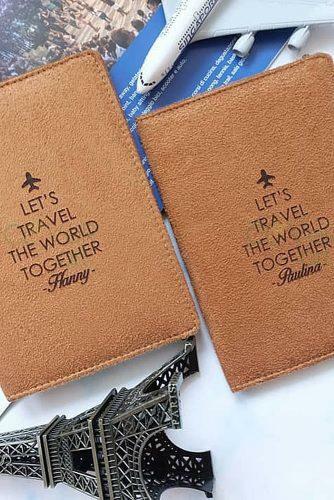 Send them off in style with – extremely appreciated – passport cases, sleeping masks, or personalized luggage tags. It’s hard to justify buying these things for yourself and very touching when someone does it for you. 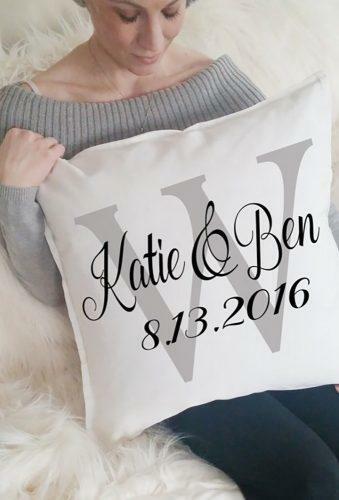 These personalized engagement gifts always go over well. The difference between a house and a Home is love and pride. 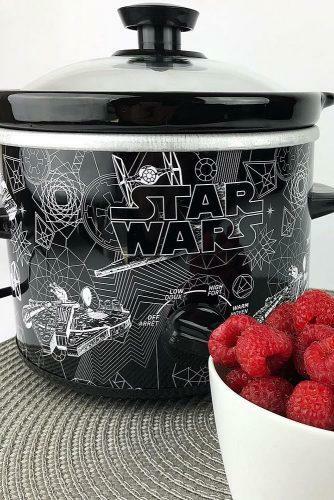 Cooking items, like this crockpot, let you spend hours in the kitchen together. 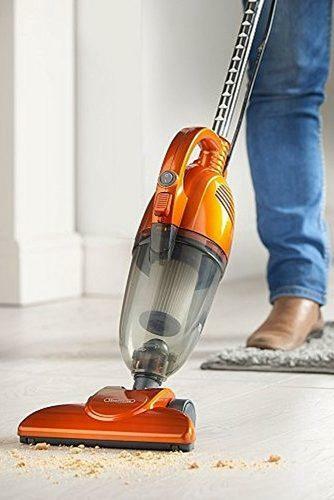 Household items may not seem glamorous, but it’s the little things that truly matter in the end and very convenient engagement gifts for couples living together. 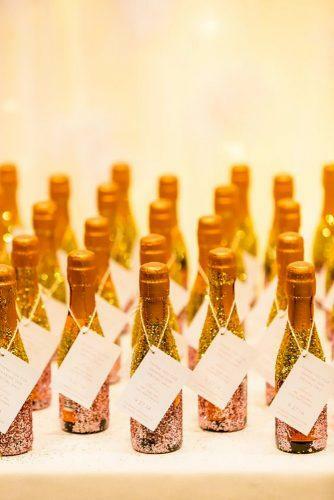 Life is face paced enough, and planning a wedding – like putting your engagement party ideas together – can seem like a year-long whirlwind. 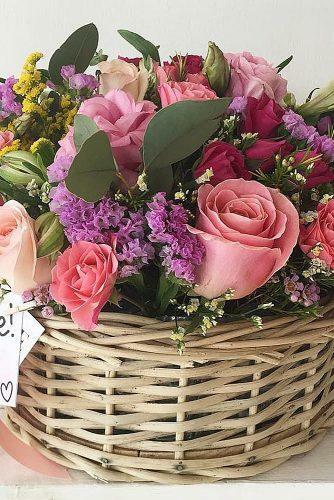 Plants and flowers are the wedding gifts that have the power to slow us down and appreciate the simpler things in life. 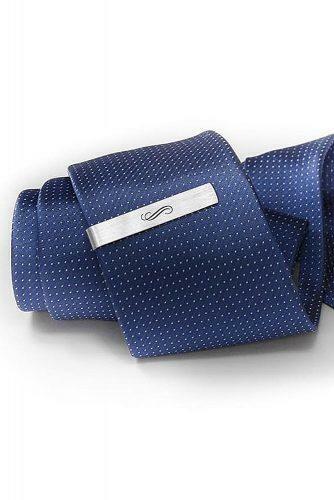 Sentimental engagement gifts for her are great — which is why we have so many fantastic suggestions for you – but sometimes we forget to be practical on the specific engagement gifts for the groom. 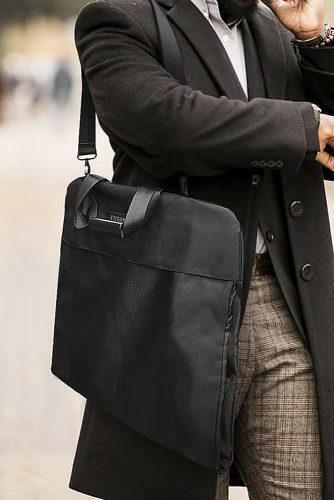 Give the gift of function with a sweet garment bag or super-handy RFID wallet. Some couples get married close to Christmas or even have a Christmas wedding theme. 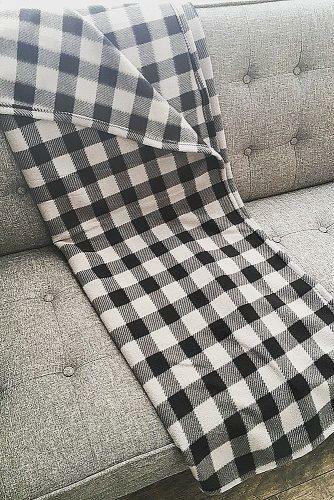 Follow suit with Christmas gifts for couples like a sweet seasonal snack bowl or keep-me-warm fleece throw blanket. 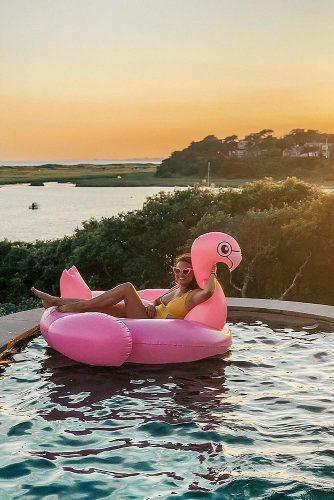 Or make an unexpected present – pool float! It will be funny. 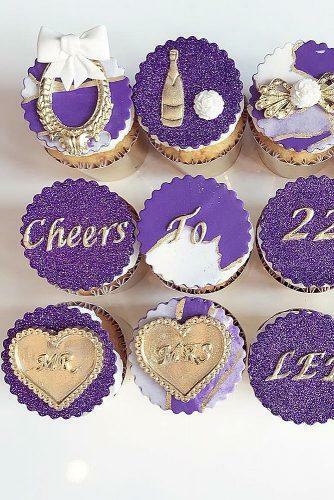 If Christmas is the theme, then be in order for some amazing engagement party games! The first rule to follow when picking out engagement gifts is not to overdo it. You wouldn’t want to throw a shadow over your wedding gift. It should be sweet, small, and thoughtful. Follow our inspiration and guidelines and you’re sure to pick a winner. Never be shy about giving money as a wedding gift. Throwing a wedding is very expensive as is the honeymoon, buying a new home, upgrading the car to accommodate a growing family, and saving for the children’s education. Contributing to the couples future stability is really a much more personal gift than you may realize. 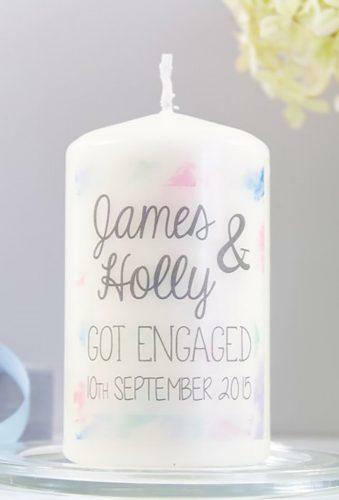 All said, the engagement party might not be the appropriate place or time – leave it for the wedding. In fact, engagement gifts aren’t even exclusively necessary at all! When they are, small gifts like we mentioned above are more than appropriate.